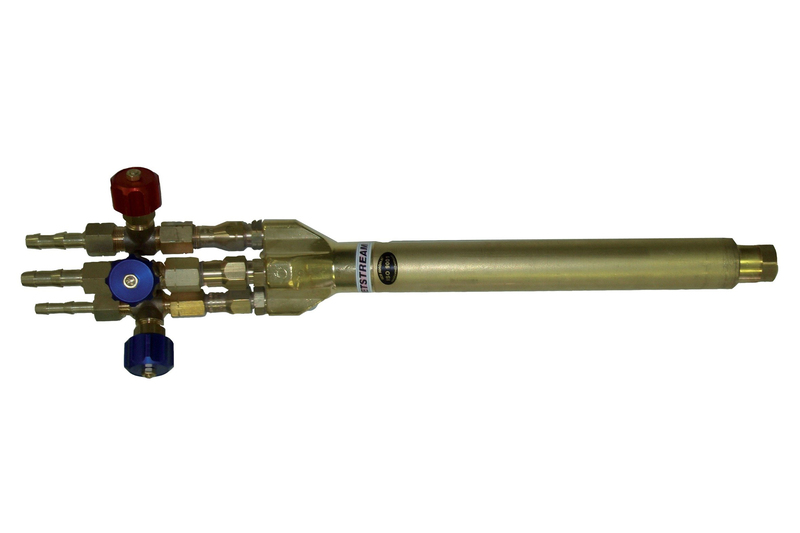 Our oxy-fuel machine cutting torches are developed to meet industry’s highest demands. The screw valves for regulation of preheating oxygen and fuel gas are forward mounted for easiest control of the flame. The cutting oxygen control knob is specially designed to give maximum control of all operations, ideal for piercing. The colour code on the knobs, red for fuel gas and blue for oxygen ensures that no mistakes are made. The special valves have a self centering stainless steel valve stem for positive seating and long life. All torches are manufactured according to the EN 5172 standards. Jetstream’s stabile and safe brass injector is placed in the massive torch body. The built in cooling flow valve provides that during preheating a small amount of oxygen flows through the cutting channel that prevents penetration of warm gases in the cutting nozzle and cutting channel. Heat is transported away from the injector which protects the torch against backfire. These features guarantee high process security, operation safety and long equipment life-time.